1627 թվականից Մովսես Գ Տաթևացի կաթողիկոսի օրոք վերանորոգվեցին գմբեթը, ծածկը, հիմքերը, սալահատակը, կառուցվեցին արտաքին նոր պարսպապատեր, հյուրանոց, խուցեր, առաստաղը, սեղանատուն: Այս մասին Առաքել Դավրիժեցին հետևյալ նկարագիրն է տվել. 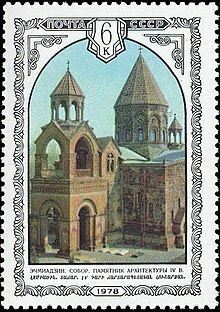 The Soviet government issued a postage stamp depicting the cathedral in 1978. Չնայած Մայր տաճարը դարերի ընթացքում բազմիցս ավերվել և վերակառուցվել է, Տաճարի ներկայիս տեսքը համապատասխանում է Լուսավորչի տեսիլքում լույսով ուրվագծված կառույցին. 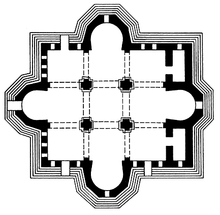 ↑ "483/484 ... the basic core of the current structure was created..." "483-484 Reconstructed by Vahan Mamikonyan. 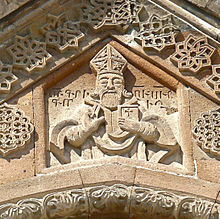 Etchmiadzin develops the design we see today."